You can create PDF and HTML by going to File > Export and then choosing the desired format. You can customize the page layout as you wish under File > Page Setup. $3:$3 Line 3 will be repeated on each page. $3:$5 Lines 3-5 will be repeated on each page. $B:$B Column B will be repeated on each page. $B:$D Columns B-D will be repeated on each page. The default setting for page layout is Landscape and Fit to 1 page wide by 1 tall. You can adjust the page settings in the Page tab. In the Header/Footer tab, you can customize your headers and footers in a number of ways, such as inserting dates, page numbers, or pictures. Simply click on the icons (see image above) to insert the desired element. You can insert the following file types in your headers and footers: gif, jpg, jpeg, and png. PDF headers and footers support only single rows. Note 1: For DynaRanges the print area needs to be at least one row (for vertical DRs) or one column (for horizontal DRs) larger than the DynaRange(s). Note 2: Languages written from right to left are displayed from left to right. This error is currently not fixable. Note 3: PDFs can only be created with the correct font if the used font is available ( for Windows in the folder …\Windows\Fonts). Otherwise, the PDF file will be created with a similar font, or, as in the case of characters in Comic Sans MS Italic, the characters will be created non-italic. Note 4: To print PDFs of multibyte characters languages (e.g. Japanese), the font Arial Unicode MS must be available on the server as the default fallback font. For servers on Linux this font is shipped with the Jedox setup. If Arial Unicode MS is not available on the server, you must set another multibyte font as the default fallback one. 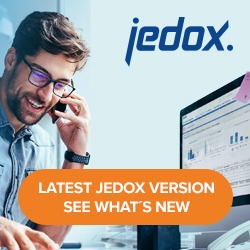 For more information on how to change the Jedox Web Settings, see Overview of Jedox Web Settings.